The latest figures for the prevalence of diabetes are two years old and by common medical consent hopelessly out of date. It is estimated that up to three million people die from the disease every year, and over a quarter of a billion people are affected. Both figures are likely to be very short of the mark. World Diabetes Day is on 14 November and all over the planet events are taking place to draw attention to the threat of what is described as an epidemic that is out of control. Already it kills more people than HIV/Aids and the prognosis is grim. India is the nation with most diabetics. 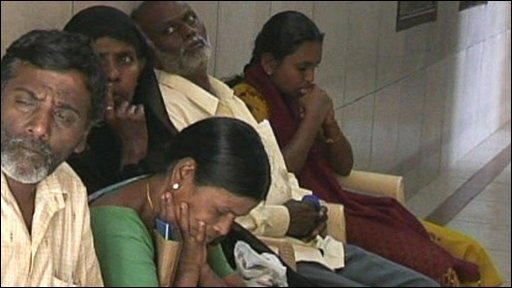 Officially there are 41 million Indians with the disease, but in Chennai, Tamil Nadu as many as 15% of the population suffer. Elsewhere in the vast country, doctors report diabetes rates of between 9% and 14%. So, even taking the lower of the two marks, it is clear that India, with its population of 1.1 billion, has upwards of 100 million diabetics and that figure is growing every year. Diabetes causes myriad medical complications: heart disease, blindness, loss of limbs and death. Nagabushan has little sight left. He can see light and dark and he can pick out a few shapes, but his vision has deteriorated very rapidly in the past couple of years, a victim of diabetes. He has come for his monthly check-up on the mobile eyecare truck which has pulled into his home town, Shimoga, for the day. Shimoga is in the heart of rural India in the southern state of Karnataka. What worries the health professionals is that type 2 diabetes, which is the variety that is spreading so fast, is on a seemingly unstoppable rise in villages and rural areas. Type 2 diabetes is known as the "disease of affluence"; it preys on people who, as they become better off, take less exercise and change their diet away from fresh vegetables and fruit. 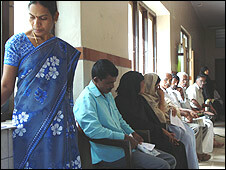 Professor Ramachandran, a diabetes physician in Chennai says: "Of course people want to be better off. They want to have an easier lifestyle. "But what many of them don't realise is that as they adjust their lives and become more sedentary and consume more junk food they are opening the door to diabetes." Nagabushan noticed that his eyesight was weakening, and he started experiencing a loss of sensation in his feet - both classic symptoms of diabetes, but he put these down to advancing years. He had never heard of diabetes. Eventually he did go to his doctor, who diagnosed the disease, already at a fairly advanced stage. In one respect Nagabushan has been fortunate. 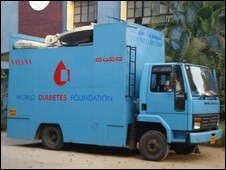 He could never have afforded to travel for treatment to the nearest big city - Bangalore, six hours' drive away - but concerned doctors and healthcare professionals, backed by the World Diabetes Forum, commissioned the building of a truck equipped with some of the latest eyecare technology. 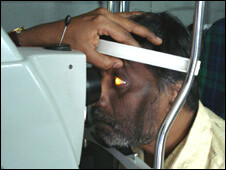 It tours round Karnataka taking eyecare to people in remote locations. Nagabushan has been told that they cannot restore his lost vision, but they can stop it getting any worse. In many respects it has already too late: Nagabushan's near-blindness has forced him to stop running a stall in the market from which he earned barely enough to keep his family. He depends now on the charity of others. In Chennai, KJ Thomas is at the other end of the socio-economic scale. He is a retired professional and has had diabetes for 25 years. He can afford to pay for treatment to keep it at bay. He has been told that a changing lifestyle has probably caused his symptoms, but this puzzles him. "I am not obese," he said, "and I get up every morning at 4am and have an hour's walk." Mr Thomas's experience highlights the other huge threat to Indians posed by diabetes. 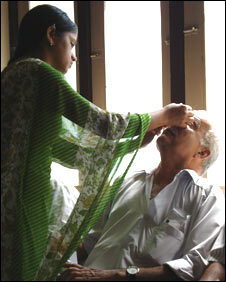 For reasons that doctors do not fully understand Indians seem to have an unnaturally high risk of contracting diabetes. So if they stray just slightly into an unhealthy way of living they become very vulnerable. The Indian government has plans to set up a public awareness programme to warn citizens of the risk. Diabetes can be averted if the right measures are taken early enough. Responding early has become critically important, because there are now signs that young people - even those in their early teens - are getting Type II diabetes. Diabetes used to be a disease of the elderly and middle aged. If it gets a grip on the young, the outlook is very bleak.